As long as I live, no genre of food will seduce me as much as dim sum, the tradition of steam/fried/baked small-plate dishes ubiquitous in my native Hong Kong. Because so many of us Cantonese decided to immigrate overseas in the 1980s and 90s, most major metropolitan with a healthy population of Chinese will have dim sum restaurants, so you can thank us for that benevolence. But with good dim sum restaurants also come bad dim sum restaurants, and I’ve long wanted to write a field guide about how to tell good from bad—and more importantly, good from great. Because there are more dim sum dishes than playing cards in a deck of 52, I’m going to break these guides up into a multi-part series. In each post, I’ll break down what we Chinese look for when venturing to a dim sum restaurant. In this edition, we’ll tackle the six greatest savory hits. When I need to quickly assess the quality of the dim sum parlor, an order of har gow will tell me if it’s worth my patronage. This is the dish that separates the wannabes from the legends. Look at the dumpling—is the pleating evenly crimped? Is the purse shape consistent between the four pieces in the bamboo basket? Is the shape pleasing to the eye? All these things will likely indicate the kitchen staff’s attention to detail, or lack thereof. Dab a little soy sauce and chili oil, then take a bite. The wheat-and-tapioca-starched skin should be smooth and tacky, most definitely not dried out. The shrimp should feature a texture that’s toothsome and lusciously tender. Please note: Pork fat is generally used with the shrimp filling. 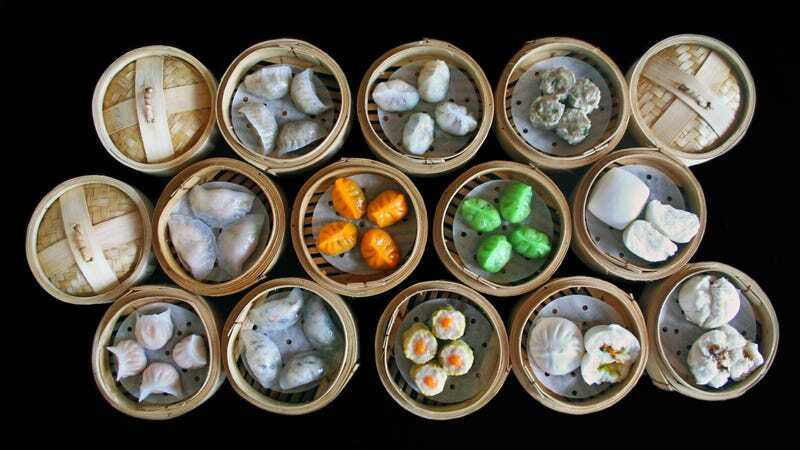 Shu mai is har gow’s meatier, more crowd-pleasing cousin: a steamed dumpling with minced pork, shrimp, mushrooms, and bamboo shoots, cupped in a thin egg dough wrapper, and topped with a orange garnish dot. Let this decorative touch clue you in on the restaurant’s quality: Cheaper kitchens will top with carrot, while higher-end establishments will go with crab roe. Either really doesn’t add much to the taste; it’s mostly for aesthetics. Also pay attention to the yellow egg wrapper. A filling that’s even with the top edge of the wrapper—meaning the wrapper hasn’t drooped, or the filling isn’t overflowed—are good signs of a quality shu mai. Same textural rule from the har gow applies here: toothsome, bouncy, fresh texture that’s satisfying to sink down with teeth. I also favor a dab of soy sauce and chili oil here. Understandably, there is fear amongst dim sum newbies when it comes to chicken feet. I get it. It’s feet. But if you like the idea of chicken skin and its fatty and unctuous quality, you’d be doing yourself a disservice by skipping out. Deep fried, steamed, and stewed with garlic, soy sauce, and fermented black beans, approach chicken feet as you would the chicken wing tip—slurpable appendages of skin and tendon. There’s not much subtlety to its flavor; look for savory soy and garlicky sweet notes. Ahh, Cantonese tamales. I find our version interesting, if only for the melange of filling stuffed inside. The ingredients will vary from restaurant to restaurant, but a constant is dark meat chicken, Chinese sweet sausage (lap cheung), and mushrooms. You know the kitchen isn’t skimping if you find two additional ingredients: 1) dried scallops, 2) a salted egg yolk nestled amongst the filling. Entombing the stuffing is a pocket of savory glutinous rice, and the lotus leaf that wraps around imparts a subtle smoky tea-like flavor to the rice. One of my favorite dim sum offerings. I wrote about wu gok last year on this very site, claiming this to be “the best thing you’re not ordering at a dim sum restaurant.” I stand by this assertion. For newbies, I just describe this as a deep-fried, meat-filled, mashed potato ball—but compositionally more interesting. A wu gok is something of an engineering marvel: The exterior is a latticework of honeycombed fried batter, cocooning a ball of mashed taro root stuffed with ground pork and sometimes mushrooms. The most alluring part is that crispy, lacy crust (lard is one of the reason it gets this way) and it’s incredibly hard to nail this texture. Whenever I order wu gok, I always look at the paper doily underside holding these football-shaped croquettes. If it’s sodden in oil, it usually means the kitchen fried it at a too-low temperature. If you find one that’s crispy and grease-free, you know you’ve stumbled upon a keeper. Ask the 10-year-old me what my favorite dim sum dish is, and I’ll unreservedly say steamed spare ribs. These bone-in ribs require diners to pop in mouth, extricate bone, and spit out. Doing this, you’ll slurp off the fatty pork, steamed in an aromatic sauce of fermented black beans, chili and garlic. It’s tactilely satisfying. These one-bite spare ribs should be glistening, the meat juicy and meaty, and you should express no reservations slurping, spitting out, and making a general mess.